Henry George Dade was born in Yeovil in 1893, the only child of William Dade and his wife Martha. In the 1901 census the family was living at 6 Quidham Place. William gave his occupation as 'Engine Driver at Mineral Water Factory' which was presumably the large mineral water factory behind the Royal Osborne Brewery in Sherborne Road rather than the smaller factory in Union Street. Martha gave her occupation as glover. Henry was aged 7. By the time of the 1911 census the family had moved to 2 South Place, off South Street. William gave his occupation as a skin dresser's labourer, Martha gave hers as a glove stitcher and Henry gave his as a glove cutter. In 1909, at the age of 16, Henry joined a Territorial Battalion of the Somerset Light Infantry. When war broke out in 1914 Henry was called up and became a Private (Serial No 1579) in the 1st/5th Battalion of the Somerset Light Infantry. The 1st/5th Battalion was a Territorial Battalion formed on 4 August 1914 at the County Territorial Hall, Taunton as part of the South-Western Brigade, Wessex Division. It was initially stationed at Plymouth for a few days and then proceeded to Salisbury Plain. On 9 October 1914 the Battalion, including Henry Dade, sailed from Southampton and arrived at Bombay, India, on 9 November 1914. The battalion remained at Jubbulpore until December, when it proceeded to Ambala. Strenuous training began almost immediately and continued almost for the next year. The following months were mainly occupied in training the draft but even in the hills little was done beyond this owing to the exceptionally wet season. By 1916 Henry had made the rank of Corporal. Sadly, in August 1916 Henry Dade was hospitalised with 'ptomaine poisoning'. Ptomaine poisoning, a term not used today, is caused by bacteria and is a type of bacterial food poisoning that is mainly caused by toxic products from bacterial metabolism. Unfortunately on 31 August 1916 he died. He was just 23 years old. 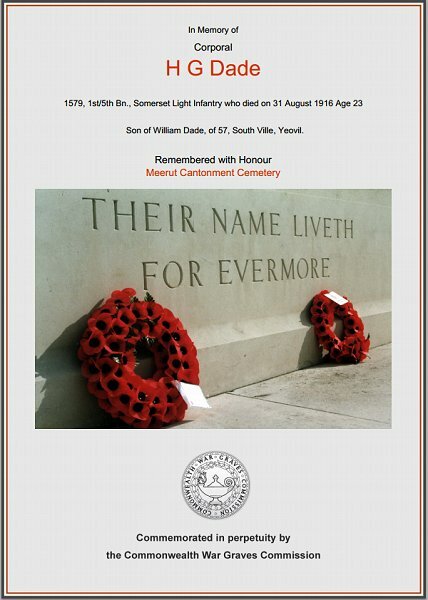 On 20 September 1916, the Western Gazette reported "Official news has been received from the War Office by Mrs Dade of Southville, that her son Corpl. H Dade, died on August 31st of ptomaine poisoning in India. Corpl. Dade, who was 23 years of age, had been seven years in the Somerset L.I. Territorials. When war broke out he was called up, and was amongst the first draft of Yeovil men to leave for India. Corporal Dade was a very popular figure in Yeovil football circles, having played at different times for several local teams. Much sympathy is felt for the bereaved parents." Henry George Dade was interred at the Meerut Cantonment Cemetery, about 85km northeast of New Delhi, India. His name is recorded on the War Memorial in the Borough - albeit incorrectly written as Dade, HC rather than Dade, HG. The Commonwealth War Graves Commission certificate in memory of Henry George Dade.